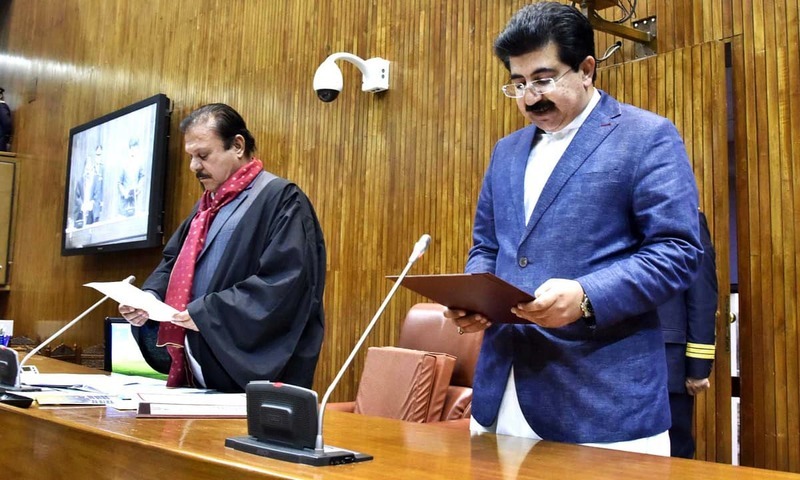 Balochistan Senator Sadiq Sanjrani — elected to Senate as an independent in the March 3 election — was sworn in as Senate Chairman Monday evening after he secured 57 votes out of the total 103 cast for the seat, defeating the PML-N's Raja Zafarul Haq, who managed only 46. His election as the first-ever Senate chairman from Balochistan marked the day's second historic moment. The first had been the swearing in of Senator Krishna Kohli earlier in the day. Polling had taken place via secret ballot. The counting was held shortly after the final vote was cast, with a nominee of each candidate overseeing the process. The margin of victory was a surprise to many, with observers having predicted a much closer race than an 11-vote gap. The Senate's decorum was interrupted briefly as the counting for the Senate chairman's election wound to a close, with observers in the galleries erupting in cheers for PPP Chairman Asif Ali Zardari — crediting him with engineering Sanjrani's victory — as soon as Sanjrani crossed the 52-vote mark. A brief tussle also erupted between Prime Minister Shahid Khaqan Abbasi's son, Abdullah Abbasi, and the Pakistan Tehreek-i-Insaf's Engineer Hamidul Haq as soon as the new chairman was announced. Both were removed from parliament shortly thereafter. Promptly after being sworn in, Sanjrani began proceedings for the election of the deputy chairman of the Upper House. 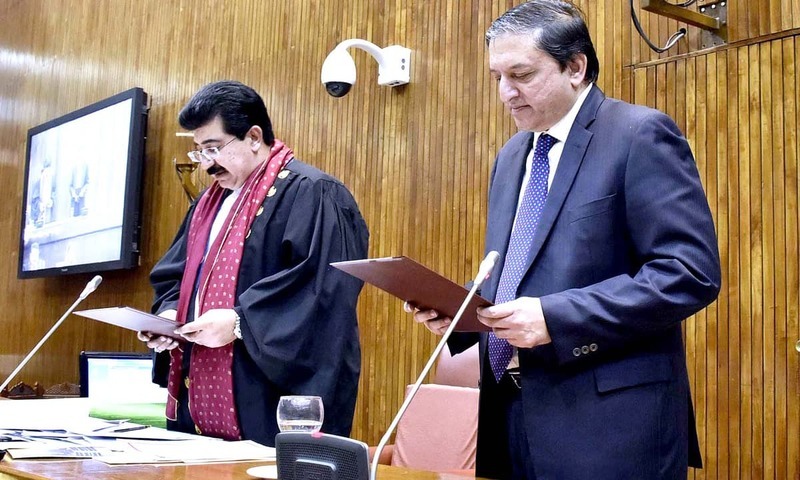 The election for the deputy chairman handed the opposition its second victory for the day, with PPP Senator Saleem Mandviwalla elected to the seat with 54 votes against the PML-N backed Usman Khan Kakar of the Pakhtunkhwa Milli Awami Party, who secured 44 votes. The MQM's five senators abstained from the deputy chairman's election. The announcement of the deputy chairman's election was similarly preceded by jeering from ruling party representatives and cheers from PPP workers. 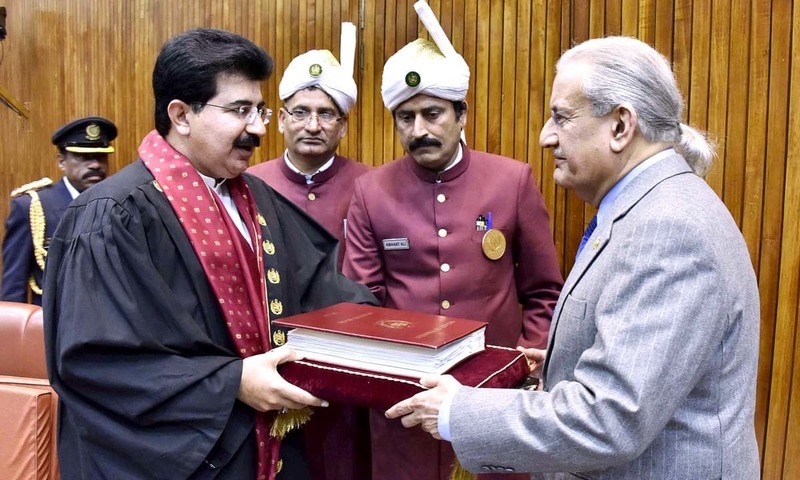 Senator Sadiq Sanjrani had been backed by the joint opposition, including the Pakistan Peoples Party (PPP), Muttahida Qaumi Movement-Pakistan (MQM-P), Pakistan Tehreek-i-Insaf (PTI) and independents from Balochistan and the Federally Administered Tribal Areas (Fata). PML-N veteran Raja Zafarul Haq, on the other hand, had been nominated by the ruling party and supported by its coalition partners. The PPP's Saleem Mandviwalla and Pakhtukhwa Milli Awami Party's (PkMAP) Usman Khan Kakar were the nominees fielded by the joint opposition and ruling party's bloc respectively for the post of deputy chairman. The nomination papers of all four candidates had been accepted earlier today. In last minute wheelings and dealings for the top posts in the upper house, eight Fata members had announced their support for Sanjrani, while the MQM-Ps' Bahadurabad group said it would not support Saleem Mandviwalla for the post of deputy chairman. Explaining his party's stance after a meeting with Balochistan Chief Minister Abdul Quddus Bizenjo and Sanjrani, MQM-P Senator Khalid Maqbool Siddiqui said: "It will not be possible for us to vote for the PPP [deputy chairman] candidate [Saleem Mandviwalla]" due to the PPP government's performance in Sindh. Prior to the polling, Sanjrani had appeared confident of victory and claimed to enjoy the support of over 70 members of the house, hinting at defections from the PML-N and its allies. However, even without defections, Sanjrani had remained in a strong position with support from the PPP [20 votes], PTI [12 votes], Fata independents [8 votes], Balochistan independents [6 votes] and MQM-P [5 votes]. The PML-N, which appeared to be floundering without the backing of other major players in politics, had held meetings with allies today to finalise their nominees for the top posts after Sanjrani emerged as the joint opposition's top contender on Sunday. During a meeting at PML-N leader Raheel Muneer's residence in Islamabad earlier today, the ruling party and its allies had decided on Raja Zafarul Haq as their pick for chairman and Kakar for deputy chairman, according to Senator Mushahidullah. In addition to the PkMAP, the Jamiat Ulema-i-Islam-Fazl (JUI-F), National Party, Awami National Party (ANP) and Jamaat-i-Islami (JI) had all thrown their weight behind the PML-N backed candidates. ANP Senator Sitara Ayaz said its sole vote would go to the ruling coalition's candidates as the PPP had refused to field Raza Rabbani as its candidate for the slot of chairman. 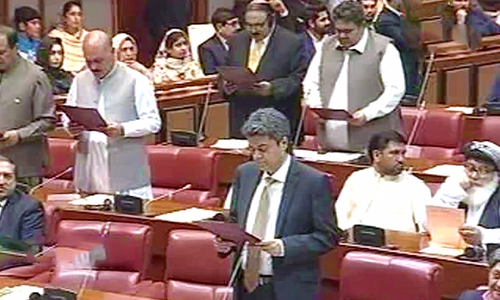 Earlier in the day, 51 newly elected senators took oath in a ceremony held in Islamabad. Presiding Officer Yaqoob Nasar administered the oath for the senators elected via polls held on March 3. Senators were then invited to sign the member rolls. Only Ishaq Dar did not take the oath as he is undergoing 'medical treatment' in London. His election as a senator is being contested in the apex court. Speaking to the media, outgoing chairman Raza Rabbani had dispelled the impression of disagreements within the PPP and said that he stands with his party. He was answering a question regarding his reaction to PPP Co-Chairman Asif Ali Zardari's comments casting doubts over the three-year stint of the party stalwart as the house's custodian and him siding with former prime minister Nawaz Sharif. "Everyone has a right to their opinion," Rabbani responded. 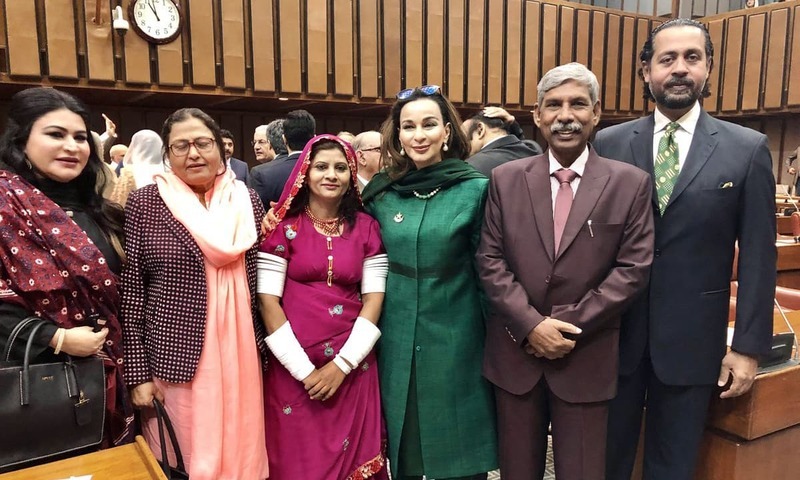 PPP Senator Krishna Kohli, the first Thari Hindu woman to be elected to the house, had arrived along with her family in traditional Thari attire. She had expressed her desire to work on healthcare and water-related issues, which she said were the the biggest problems faced by women in Tharparkar. 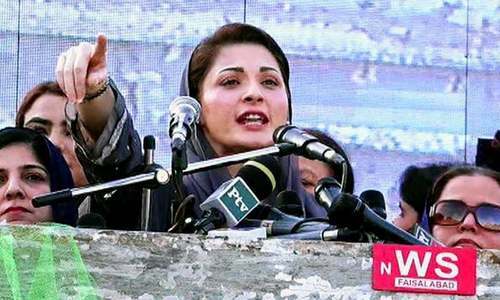 While talking to DawnNewsTV, Punjab Law Minister Rana Sanaullah had accepted that it was going to be close race but expressed satisfaction "because puppets of the non-democratic forces have been exposed." He accused Asif Zardari and Imran Khan of being "pawns of the establishment" and claimed their candidates were still a couple of votes behind the PML-N coalition's candidates. "This is a victory for democratic forces," Sanaullah had said. Explaining Nawaz Sharif's proposal for the candidacy of PPP's Raza Rabbani, he said that the party knew it would never happen as "the nomination was never in the hands of Zardari, and forces he [Zardari] has sold himself to would never allow [Rabbani's candidacy]." With additional reporting by Javed Hussain. Such a waste of money and time to support this half way democracy which guarantees the suffering of common Pakistanis and of cnd these self centered selected good for nothing by the elected members, most of them are from rural areas where common person have no right. If these elected politicians are left alone to work for the betterment of Pakistan then it would be wonderful otherwise they will be a burden on our economy. We must all think for Pakistan first. Mr. Sadiq should be on the driving seat! Lets start with fresher, instead of trying the old folks, which gave us little to no hope! I would like to see an independent chairman of Senators instead of PMLN or PPP, who dominated the floor for a long time without doing much for poor people. I hope the new elect chairman will act impartially for the sake of principles, integrity and welfare of the needy people! And the greed for more power and more money by the so-called politicians continues while the majority of Pakistani people are living below poverty line in dreadful and miserable condition. A common man in this country don't even have clean drinking water let alone basic healthcare and education. Sadiq Sanjrani, the suitable candidate. The faces in the two pictures speak volumes as to who is really more confident and symbol of genuine change in the middle of status quo. I am very strange, that all are thinking that Sanjrani is good choice. Please note raja and Sanjrani are equals. sanjrani is also a Sardra of tribe, so just think Sardar kia hota hy. All are corrupt and note one thing that Bloachstan reasons of non development is only these Sardars/ Mirs/ Nawabs. Raja Zafar ul Haq is probably the best man, he has all the qualifies of a good leader----his selection signal one thing and that is that PML has sensed that they will not win----they would never have nominated him, if they knew they were going to win--- they are more afraid of good people among their own party than the worst people of opposition--- and same goes to people party, they will never nominate Aitzaz Ahsan for important position---I don't know how they put up with such treatment for so long. The ones who tweet more have an agenda that crosses path with conscientious work towards uplift. Tweeting is a fad that has lasted longer than it should've. The candidate brought by PMLN is of good repute. May what's best for Pakistan come to fruition. PMLN is in for a surprise, evident of vanning power of disqualified Sharif slowing kicking in. AND these are the people who will prosperity, jobs and leadership to Pakistan. Good luck with that!! Let us wait to see what kind of democracy is brought about by the new Senate. PMLN panel is indicative of blowing hot and cold together. Nomination of Zafarul Haq sends a message of reconciliation while that of Usman Kakar of PKMAP represents a confrontational approach. Good move by PTI to have the chairman elected from Balochistan. It is wonderful to see a person rising from less previliged area ! Tells you all about the Character and democratic credentials of Mr Sanjarani. Case closed. Congratulations and best of luck Sadiq Sanjarani as Chairman Senate and for enhancement of integrity of Pakistan. Very sad. Tragic day. No one from mainstream political party is Chairman Senate. A person whose election as senator was doubtful is elected as Chairman Senate.It reminds me T S ELLIOT poem WasteLand: What are the roots that clutch, what branches grow Out of this stony rubbish? Son of man, You cannot say, or guess, for you know only A heap of broken images, where the sun beats, And the dead tree gives no shelter, the cricket no relief, And the dry stone no sound of water. The only test of a true democracy is when the unexpected gets a chance. I think Pakistan is headed in the right direction in the light of the recent election results. Congratulations Sir. Congratulations to Pakistan. Lets hope things move to more positive in near future and common citizens get their right and basic needs. We have great hope for betterment of our nation. Thanks to our judiciary and also armed forces for efforts, InshAllah Pakistan will emerge as one of the best nations in world soon. Good to see Senate's Chairman from Baluchistan, which is the most deprived province of Pakistan. One thing is sure that this prevailing democracy is suited & trailered made for those who can invest in millions & mint money in billions ! Great to see a Senator from Baluchistan elected as Chairman of the Senate. Congratulations Senator Sadiq Sanjrani. This is a positive step towards healthier democracy. Time to seriously think about general elections by PML-N.
That's got to hurt King Nawaz, who likes to reign over his imaginery Kingdom, which is shrinking by the day. @Nawaz : Good to see a Nawaz praising Imran Khan and PTI for a change! It's time NS should read the writing on the wall. Mr. Imran Khan, Enough is enough. PTI should have been neutral. Mr. Imran Khan, do you have any shame? I and my family will never support PTI. Today was a Good Day for Democracy in Pakistan. PML-N should graciously accept their defeat and move on. Instead of focusing on the tactics of their opponents, it is better to focus on the upcoming general elections. Let the new chairman Senate, and the coalition that backed him, run the Senate. The PML-N may find that opposition’s victory and their subsequent conduct - as they try and undermine each other - may actually be another benefit in the general elections. So IK and AZ are officially cousins now. Ignored MQM and lost their vote ! Benefited JUI F but they did not vote of PML N ! This is the beginning of the end of NS and perhaps PML-N. This is not Democracy, this is straight up horse trading, you support our guy and we will support yours. Good to see that PML-N is seeing the reality that it cannot monopolize rule in Pakistan. PM Abbasi and his son are frustrated as seen in his son's reactionary physical attack against other party members. NS family is losing their grip slowly and surely. PTI - PPP alliance? What happened to Imran's allegation against Zardari? Nawaz is still better than Zardari ! Imran helped Zardari to accomplish his ulterior motives ! Imran has helped one corrupt to defeat another corrupt. He himself is the third corrupt in this game ! So, the main opposition parties could not find anyone suitable for the position within their own ranks.. What a shame.. This is a defeat for democracy, a defeat for Pakistanis where non-democratic forces have triumphed in shoving aside an admirable politician in the person of Raza Rabbani, the champion of justice, freedom and equality, to replace him with a more malleable person. One man show selected as the Chariman of Senate, just to dislodge PML(N), this shows the loyalty of our political parties towards Pakistan who do not look at the National interest of the country. I still imagine if he becomes Acting President of Pakistan? wonders will happen?. PTI and PPP has shown their loyalty towards Pakistan. We should all work for Pakistan.